If you have a dream project that needs expert plating to finish it off just right, we can provide the quality and service that will meet or exceed your expectations. 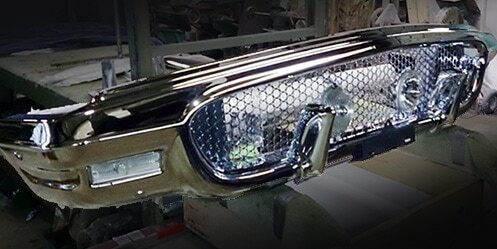 Cambridge Custom Chrome offers a full range of plating services, backed by our One Year Limited Warranty. We make it real easy for you by providing FREE pickup and delivery anywhere in Canada and the U.S. 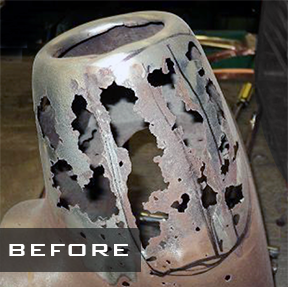 Restoration and plating of pot metal. We don’t just polish the pits, we drill and fill. This extra step ensures pit-free parts that are better than new. All types of metals, including aluminum, stainless steel, pot metal, etc. Bumper repairs, including straightening and patching. No project is complete until the chrome is perfect. 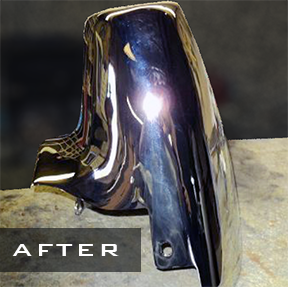 We do custom plating for cars, boats, motorcycles and other vintage collectibles. Free pickup and delivery anywhere in Canada and the U.S. (some restrictions apply). Job estimates for most bumpers may be obtained by phone (excluding repairs). We have a large inventory of antique car parts and bumpers. For our American customers, we maintain a secure facility located at the Laub Warehouse at 1051 Clinton Street, Buffalo, NY.